The Aluminium Tower/Shaft Melting and Holding Furnace is most suitable for the high efficiency melting of ingots and casting returns. The furnace is divided into two chambers with the holding section located directly under the melting bridge. The vertical alignment of the chambers enables the holding bath to have a large surface area and small bath depth which provides very good homogeneity of the bath temperature. 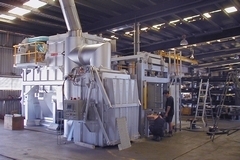 The melt burner exhaust gases are utilised to heat the holding bath. This enables considerable energy savings and low exhaust temperatures. Liquid aluminium can be taken from the furnace during melting. The furnace can be equipped with an integral charging machine for charging of ingots and returns. Low energy consumption (Approx 2340 MJ to melt one-tonne aluminium). High quality non-wetting cast refractory for long lining life. Superior insulation: Low furnace skin temperatures. Pouring / discharge of metal from below the bath surface. Load cell weighing system to control charging and melting sequence. Robust casing including charging and cleaning doors.